We ship furniture that's boxed or unboxed, we ship furniture that's brand new, and we ship furniture that's been in the family for generations. 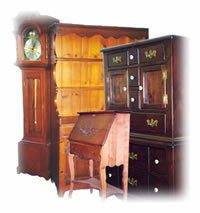 We ship antiques, items sold on eBay, you name it - if you need to ship furniture, call Pak Mail Key West. Pak Mail Key west currently does packing and shipping for several island furniture stores including Art @ 830, Fast Buck Freddies @ Home, and Key Accents.